Guinea's defender Fode Camara (left) heads the ball over Ivory Coast's forward Wilfried Bony in the Africa Cup of Nations tournament. 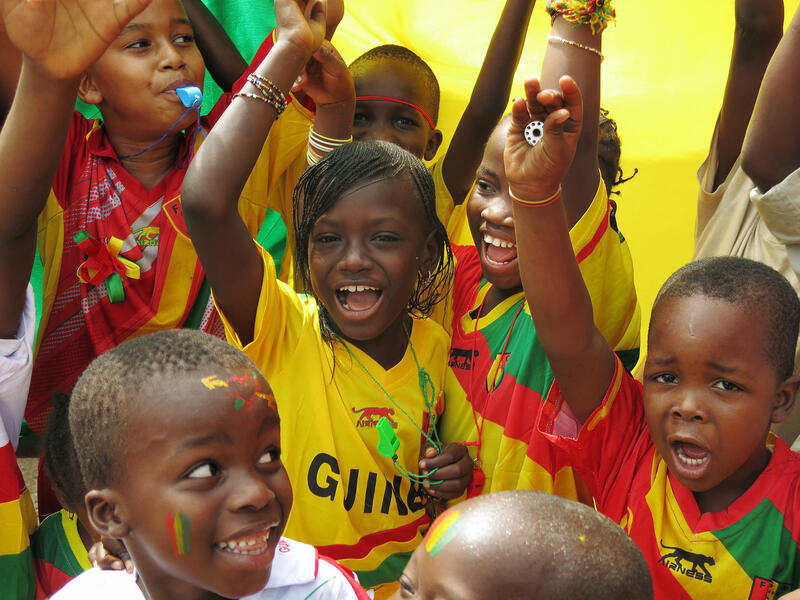 Children showed off Guinea's national colors before their team's opening match with Ivory Coast in the Africa Cup of Nations. 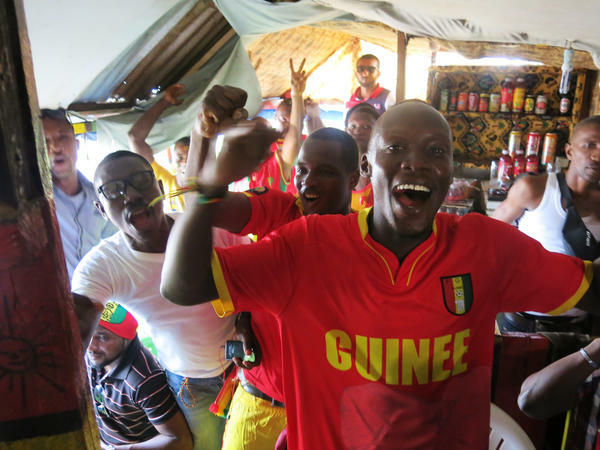 Fans in a makeshift sports bar in Conakry celebrate when Guinea scores a goal. Offices and businesses closed early — so that people could watch Guinea take on Ivory Coast in Africa's premier soccer competition, the Cup of Nations. Some went home while others headed to a nearby sports bar. Inside the ramshackle hut with a view of the Atlantic Ocean, a few dozen men and women squeeze onto an assortment of benches, armchairs and stools — breaking Ebola's cardinal rule about no contact and no touching. But they're too excited about soccer to remember the healthcare advice. All eyes are on the TV, which is broadcasting Guinea's opening game against Ivory Coast. Guinea scores, and cheers erupt. Soccer player Mohamed Yattara has just scored in the 36th minute. That put Guinea's National Elephants, in white, ahead of Ivory Coast's orange-clad Elephants (the team names are the same). But you can't quite get away from Ebola in Guinea. Excited fans chant, "FC Ebola, FC Ebola," which translates to Ebola Football Club. They add in: "Ebola must go, Ebola must go!" In the 72nd minute, Ivory Coast scores and a collective groan travels across the room. The Guinean supporters look deflated. They thought the player was offside, and the goal shouldn't count. That's how the match ends: a 1-1 draw. "Oh well, we were hoping Guinea would win," says fan Mohamed Conde. "But I'm really proud of my team." And Guinea's National Elephants still have a chance to advance in the tournament. "Vive La Guinee et adieu Ebola," he adds. That's "long live Guinea and out with Ebola." Today, the people of Guinea tried to forget about Ebola for just one day. They focused instead on soccer. That's because Guinea's national squad played Ivory Coast in Africa's premier soccer championship. NPR's Ofeibea Quist-Arcton watched the match with a group of fans. OFEIBEA QUIST-ARCTON, BYLINE: At a ramshackle Atlantic Ocean view cubbyhole in Guinea's capital, Conakry, a few dozen women and men squeeze into the room, breaking Ebola's cardinal rule about no contact, no touching. 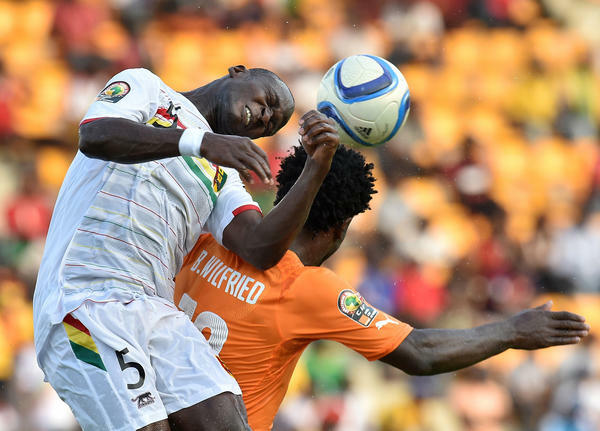 The focus was Guinea's opening game against Ivory Coast in the Africa Cup of Nations. QUIST-ARCTON: The tiny room erupted in euphoria as Guinea scored, and Guinea's National Elephants went ahead of Ivory Coast Elephants, as the teams are called. UNIDENTIFIED MEN: (Chanting in foreign language). QUIST-ARCTON: But you can't quite get away from Ebola in Guinea. Excited fans chanted FC Ebola - i.e. Ebola Football Club, adding Ebola must go. QUIST-ARCTON: And then shock - Ivory Coast scored in the 72nd minute. The Guinean fans looked deflated and the match ended in 1-1 draw. So, sir, Guinea was ahead. MOHAMED CONDE: (Foreign language spoken). QUIST-ARCTON: Mohamed Conde says, "oh, well, we were hoping that Guinea would win, but I'm really proud of my team." QUIST-ARCTON: Conde says, "long live Guinea and out with Ebola." Ofeibea Quist-Arcton, NPR News in Conakry. Transcript provided by NPR, Copyright NPR.